"Pleura" redirects here. For other uses, see Pleuron (disambiguation). 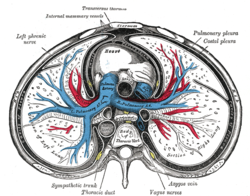 A transverse section of the thorax, showing the contents of the middle and the posterior mediastinum. The pleural and pericardial cavities are exaggerated since normally there is no space between the pulmonary pleurae and between the pericardium and heart. The pulmonary pleurae (sing. pleura) are the two pleurae of the invaginated sac surrounding each lung and attaching to the thoracic cavity. The visceral pleura is the delicate serous membrane that covers the surface of each lung (the lung parenchyma) and dips into the fissures between the lobes. The parietal pleura is the outer membrane which is attached to the inner surface of the thoracic cavity. It also separates the pleural cavity from the mediastinum. The parietal pleura is innervated by the intercostal nerves and the phrenic nerve. Between the membranes is a fluid-filled space called the pleural cavity. The visceral pleura is a delicate serous membrane that closely covers the surfaces of the lungs and dips into the fissures that separate the lobes. The parietal pleura is the outer membrane that attaches to and lines the inner surface of the thoracic cavity, covers the upper surface of the diaphragm and is reflected over structures within the middle of the thorax. It separates the pleural cavity from the mediastinum. The parietal pleura is differentiated into regions in line with the location in the thorax. The "cervical pleura" (or "cupula of pleura") is in the region of the cervical vertebrae extending beyond the apex of the lung and into the neck. The "costal pleura" lines the inner surfaces of the ribs and the intercostal muscles and are separated from them by endothoracic fascia. An extension of the endothoracic fascia known as the suprapleural membrane covers the apex of each lung in a thickened layer of connective tissue. The "diaphragmatic pleura" lines the convex surface of the diaphragm. The "mediastinal pleura" attaches to the other organs in the mediastinum and forms the separating lateral wall. The parietal pleura is supplied by the intercostal nerves and the phrenic nerve. The costal pleura is innervated by the intercostal nerves. The diaphragmatic portion of the parietal pleura overlies the diaphragm and is innervated by the phrenic nerve in its central portion and by the intercostal nerves in its peripheral portion. The mediastinal portion of the parietal pleura forms the lateral wall of the mediastinum and is innervated by the phrenic nerve. The visceral and parietal pleurae both derive from the lateral plate mesoderm which splits into two layers the somatopleuric mesoderm forming the parietal membrane and the splanchnopleuric mesoderm of the visceral membrane. The contraction of the diaphragm creates a negative pressure within the pleural cavity which forces the lungs to expand resulting in passive exhalation and active inhalation. This breathing process can be made forceful through the contraction of the external intercostal muscles which forces the rib cage to expand and add to the negative pressure in the pleural cavity causing the lungs to fill with air. The fluid in the cavity provides lubrication and cushioning. Pleurisy is a condition of inflamed pleurae. Pleurisy can lead to a build-up of fluid known as pleural effusion in the pleural cavity. Pleural effusion can also occur from other causes. ^ "pleura Meaning in the Cambridge English Dictionary". dictionary.cambridge.org. ^ a b Light 2007, p. 1. ^ Larsen, William J. (2001). Human embryology (3. ed.). Philadelphia, Pa.: Churchill Livingstone. p. 138. ISBN 0-443-06583-7. Light, Richard W. (2007). Pleural Diseases. Lippincott Williams & Wilkins. ISBN 978-0781769570. Wikimedia Commons has media related to Pulmonary pleurae. Atlas image: lung_pleura at the University of Michigan Health System - "X-ray, chest, posteroanterior view"
Atlas image: lung_lymph at the University of Michigan Health System - "Transverse section through lung"
This page was last edited on 26 February 2019, at 07:10 (UTC).